Name meaning 'with very small fruits'. Shrubs to small trees, 3–10 m high; dioecious or rarely monoecious. Outer bark smooth. Indumentum composed of simple and tufted hairs and yellow to orange glandular hairs. Stipules triangular to narrowly triangular, 4–10 by 1.4–1.6 mm, persistent to caducous. 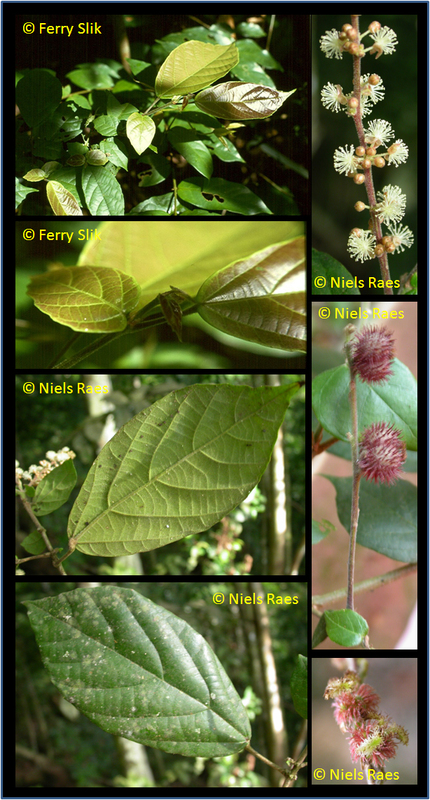 Leaves opposite, petiole 1–50 by 0.6–1 mm, densely hairy to scatteredly hairy; blade ovate to obovate (the smaller leaf obcordate), 14–22 by 5–10 cm, length/width ratio 1.8–3.3, membranaceous (to chartaceous), base shallowly emarginate, obtuse to cuneate, margin denticulate, dentate to crenate, with glandular teeth, apex caudate, upper surface densely to scatteredly hairy on midrib and nerves, extrafloral nectaries marginal in lower half, 2–7 per side, 1–2.5 mm from margin, lower surface sparsely to scatteredly hairy, sparsely covered with glandular hairs, domatia rarely present, venation triplinerved, nerves 6–9 per side, indistinctly looping and closed near margin or ending in margin. Inflorescences racemes, single, erect, unisexual or rarely bisexual; axes densely to sparsely hairy; peduncle 9–24 by 0.8–1 mm; bracts triangular, persistent; bracteoles sometimes present, triangular, 1–1.5 by 0.2–0.3 mm, early caducous. Flowers: pedicels densely to sparsely hairy; sepals 3 or 4, free, persistent, margin entire, apex acute, densely hairy and with glandular hairs outside, glabrous inside. Staminate inflorescences 6–10 cm long, nodes per branch 12–27, with 1–5 flowers per bract; bracts 1.2–1.4 by 0.5–0.6 mm. Staminate flowers 3.3–4 mm diam. ; pedicels 1.7–3 mm long; sepals elliptic to obovate, 2.8–3.2 by 1–1.2 mm; disc-glands present; stamens 40–90, glabrous; pistillode absent. Pistillate inflorescences 3.4–12 cm long, nodes per branch 10–20, with 1 flower per bract; bracts 1.5–1.7 by 0.6–0.7 mm; bracteoles absent. Pistillate flowers 2.8–3.8 mm diam. ; pedicels 1–3 mm long; sepals narrowly triangular, 2–2.4 by 0.8–1 mm; staminodes rarely present; ovary 1.3–1.5 by 1.3–1.6 mm, 3-locular, sparsely hairy, sparsely covered with glandular hairs; style 0.2–0.6 mm long; stigmas 2.2–5.5 by 0.8–1.2 mm. Fruits capsules, 5–10 by 8–11 mm, green, opening septicidally- loculicidally, surface spiny, sparsely (to densely) hairy, sparsely covered with glandular hairs; spines 100–200 (rarely more), curved, 1.5–3.5 by 0.1–0.2 mm, sparsely hairy, red; Seeds ± globose, 4–5.1 by 3.5–5 by 3.5–4.5 mm, surface smooth, shiny, dark brown. Locally common in understorey of primary forest or in disturbed areas; on basalt, clay-loam, limestone, sandy soil or ultramafic soil. Altitude: sea level up to 800 m.
Roots are used against fever.